Proper Care of Oil Paintings and Watercolors will assure that paintings will survive throughout many generations...The technical name for proper storage and hanging of artwork is Preventive Conservation....which includes proper protective procedures while the painting is entrusted to your care including: Proper Transportation, shipping procedures, art storage, matting and framing techniques and materials, and control of humidity, temperature, dust and grime. Ask about Eclectic Art & Objects Gallery's "Art Enemies" article that offers guidelines to Preventive Conservation Practices. 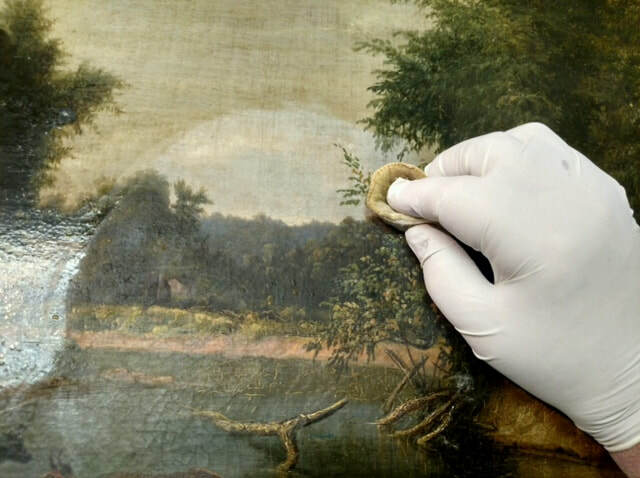 Environmental issues such as grime, moisture, yellowing of the varnish layer and general accumulation of dirt will darken and obscure details on the surface of oil paintings over time. Eclectic Gallery painting restoration professionals use time tested museum techniques and traditional solvent based formulas to restore the original color and brightness back into your aging oil paintings. Our goal is always to bring dirty old oil paintings back to their original intended color palette. We avoid using newly developed water based cleaners on oil paintings because they have a tendency to seep through any minute cracks of the painted surface which over time can result in the gesso base cracking and eventually even flake off. Acrylic paintings tend to attract dirt and grime more easily than traditional oil paintings because acrylic emulsions remain soft at room temperature which allows the dirt to migrate into the paint emulsion. Various types of coatings have been formulated to protect the painted surface but the fact remains that there is no perfect solution to cleaning acrylic paintings without some damaging effects on the acrylic painted surface. Although artists paint in many diverse styles on many different surfaces and substrates such as wood and Masonite, a typical oil or acrylic painting consists of several basic components that include: a somewhat fragile fabric substrate, normally cotton or linen, that is stretched over four wooden bars to form a square or rectangular shape. The stretched canvas is secured in place by metal tacks that are spaced approximately 2-3" apart and extend around the outside perimeter of the stretcher bars. The canvas is kept taunt by means of four wooden wedges or keys that can be adjusted to expand the inside corners of the stretchers to maintain tension across the surface of the canvas. Once the canvas is stretched in place, gesso or other waterproof coating is added to the face of the canvas as a sealer and to provide a smooth or textured base upon which the artist applies various colored oil or acrylic based pigments to form the final artistic composition. 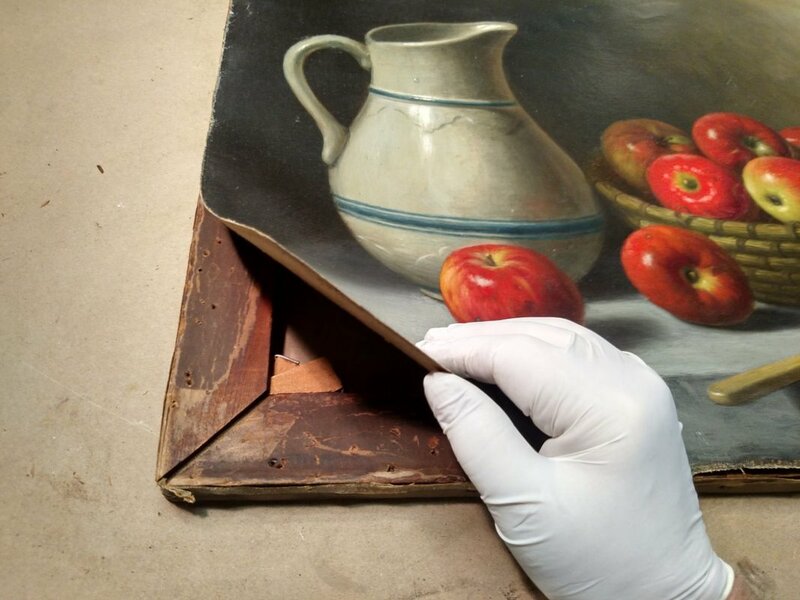 After the painting is dried, over a period of months, the pigment is coated with a protective Damar varnish which is meant to protect the pigmented surface for centuries of exposure.